As I write this the UK is going space crazy, because Major Tim Peake (giving the thumbs up, above) has just become the first publicly-funded British astronaut to fly to the International Space Station. Other Brits have flown there, and into space, but Tim is the first one who hasn’t had to change nationality or take out dual citizenship to do so. 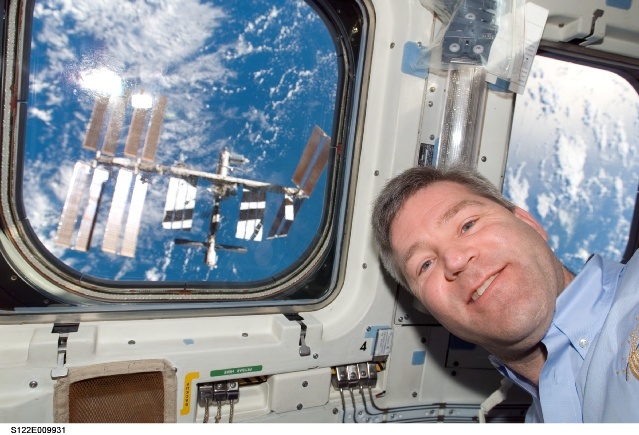 He will be onboard the space station for the next 6 months, conducting experiments, taking photographs, and generally having a fantastic time. Earlier this evening many people here in the UK were hoping to catch a glimpse of the space station as it passed over the UK, but the weather was so poor hardly anyone saw it. Disappointing, but there’ll be other chances. 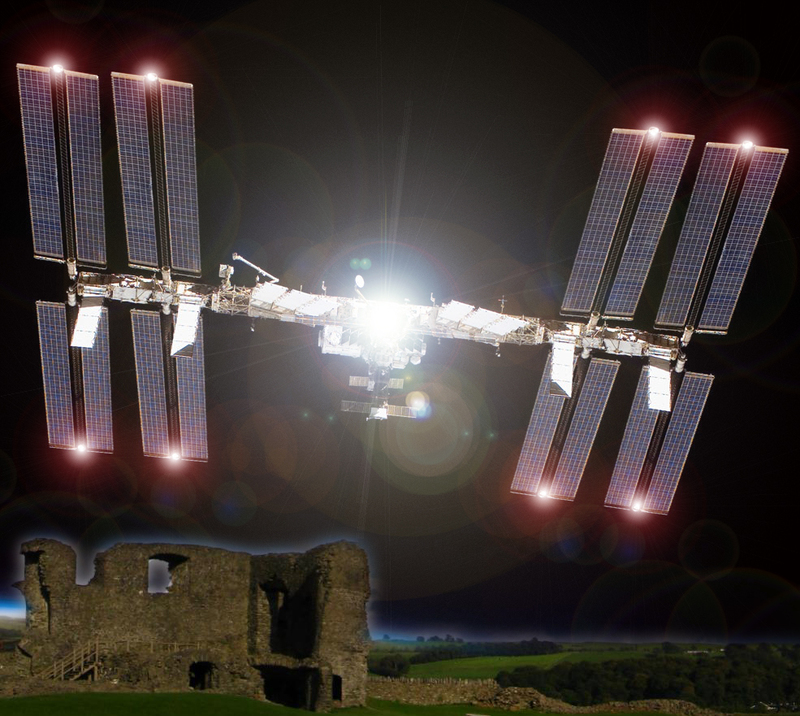 In fact, many people were amazed to learn today that they can see the International Space Station in the sky, not just above Cumbria but from all across the UK, and around the world. It’s not there every night, and when it is visible it looks more impressive on some nights than on others, but at its best it is literally a stunning sight – a brilliant “star”, often the brightest thing in the sky, as bright as a lantern, sometimes even brighter than Venus, that slowly glides across the sky from west to east. It really is a stunning sight, and many people now make an effort to find out in advance when the ISS will be visible from their garden, or town, and even head out into the countryside – or just to a local park – to enjoy watching it without light pollution ruining the view. If you are one of them, you’ll already know how beautiful the ISS can look, just as you’ll know how to find out the times of “ISS passes” in advance, allowing you to plan where and when to observe it crossing the sky. (You can just scroll down this entry to the table of ISS sightings at the end, I won’t be offended!) But if you’re a newcomer to the hobby, maybe inspired by Tim’s mission to the space station, and want to see it but haven’t a clue where to start, this guide is for you. Ok. Deep breath. here we go… First, what IS the ISS? You’ll see it’s made of many different parts, and has bits sticking out of it everywhere. The most obvious parts are the huge “wings” on either side are its solar arrays – they power the space station by collecting energy from the Sun. Between the solar array “wings” are lots of tubes or cylinders, all joined together, called “modules”. These are the sections the astronauts live and work in. They’re pressurised, like the inside of an airliner, so the astronauts don’t need to wear spacesuits, they just wear normal clothing. If they go outside they put on a spacesuit. Just like a huge Mecanno model, the ISS has been built over many years, piece by piece. Those pieces have all been joined together in space, making it Mankind’s most ambitious, complicated and risky construction project ever. And you can see it crossing the night sky, like a bright star. But how come we can see something so far away, so high above the Earth? Well, it’s the height that’s the key – because it’s so high, hundreds of miles above our heads, the ISS is still in sunlight long after darkness has fallen down here on the ground, and that sunlight reflects off its enormous solar panel “wings”, just like sunlight glints off an airplane, or a mirror, and makes it visible to us in the night sky. Actually, you’ve probably seen the International Space Station – we usually abbreviate it to ISS – many times already without even knowing what it was. Lots of people who are out and about after dark – driving home from work, walking the dog, meandering back from the pub – have seen the ISS drifting through the heavens, but thought it was ether just an airplane or a normal satellite. Of course, many people have also seen it and thought it was a UFO! But the truth is even more amazing – that “bright light” sailing across the starry sky is a man-made structure, a huge, incredibly complicated manned spacecraft that is home to astronauts from many different countries. 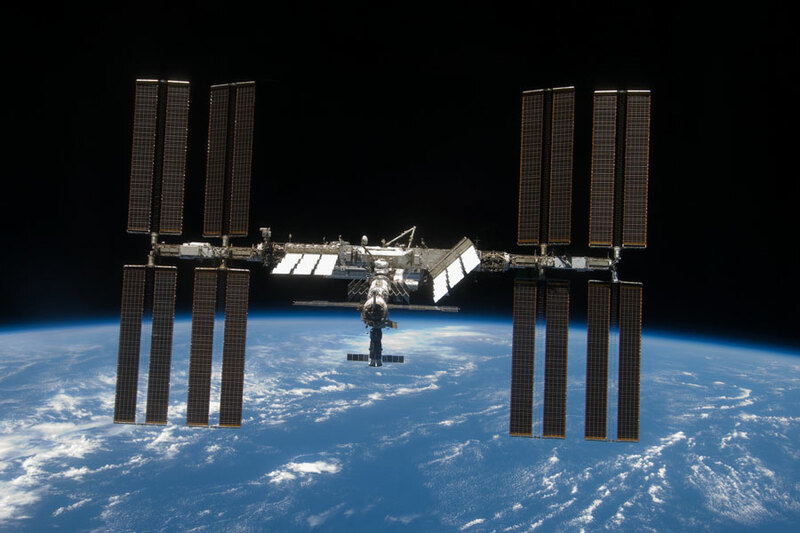 The ISS is nothing less than science fiction come true – a permanently-manned outpost in space. In recent years, as it has grown larger and larger, and brighter and brighter, “ISS-spotting” has become a great hobby among amateur astronomers and skywatchers, but you don’t need to be an astronomer – with a deep knowledge of the night sky and expensive equipment – to enjoy following the ISS as it flies through the constellations. All you need to know is what time to start looking for it. Yes, it really is that simple! All you need to do is know in advance what time you need to go outside – then you can just stand there and watch the show! Ok, so having read all that I’m sure you want to see the ISS for yourself! What exactly do you do? Here’s your guide to seeing the International Space Station. But first, a Very Important Point. At the moment (December 2015), the planet VENUS is on view in the morning sky. It looks like a very, VERY bright “star” in the east before sunrise, and many people are mistaking it for the International Space Station, which is wrong but understandable if they haven’t seen it before. So, the most basic, most golden rule of ISS-spotting is this: remember, the space station MOVES across the sky. If what you’re looking at looks like a bright star but it isn’t moving, if it’s just hanging there in one place, then you’re absolutely, 10000% NOT looking at the space station, you’re looking at the planet Venus (or just a bright star!). And if what you’re looking at is flashing, it’s a plane. The ISS has lights on the outside, but they’re so small and faint there’s no way we can see them down here far below it. 1. Find out what time the ISS will rise above your local horizon (see below). 2. Go outside 5 minutes BEFORE that time to let your eyes get used to the darkness. 3. Face the WEST (ish… sometimes the ISS rises in the SW, but face roughly west and you won’t go far wrong)… and wait. Eventually you’ll see a “star” rising up from behind that western horizon, or appearing just above it. That will be the ISS! Simple as that! 4. Just watch the ISS drift across the sky, and enjoy it! Maybe even give Tim a wave, too! Also, you have to bear in mind that not every “pass” of the ISS is going to be spectacular. Sometimes it flies almost flies overhead, but on other nights it only climbs slightly above our horizon. This means that sometimes the ISS is stunningly bright, so bright it can cast shadows from a dark site, but on other occasions it looks barely brighter than the bright stars in the sky beyond it. The BEST passes to observe are the ones when the ISS is going to be high above the horizon, because that’s when it will be most fully illuminated by the Sun, and visible for several minutes. 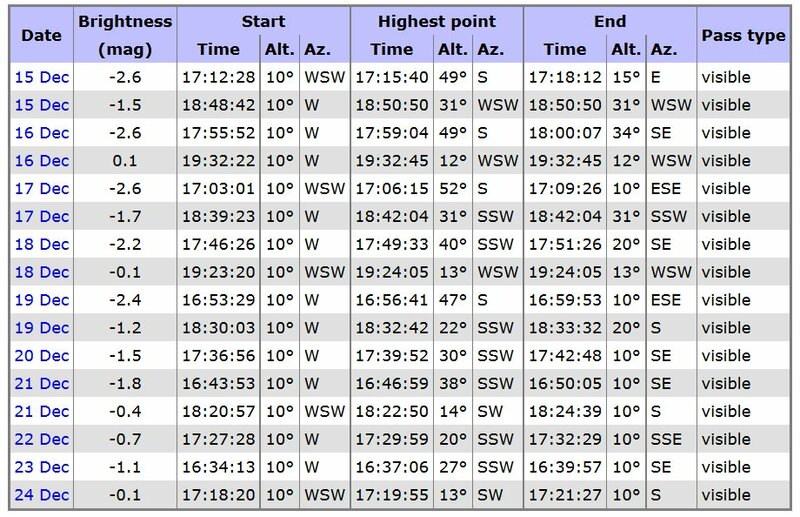 Okay, let’s look at the most important part of the whole thing – how you find the times of ISS “passes” visible from where you are. are the times you need. It’s almost embarrassingly easy. All you have to do is go to a website – and there are several – that calculates the times of ISS passes for your area. You either a) select your town or city’s name from the site’s list, or b) enter your geographical co-ordinates, and then the website does the rest. Yes, it really is that simple. 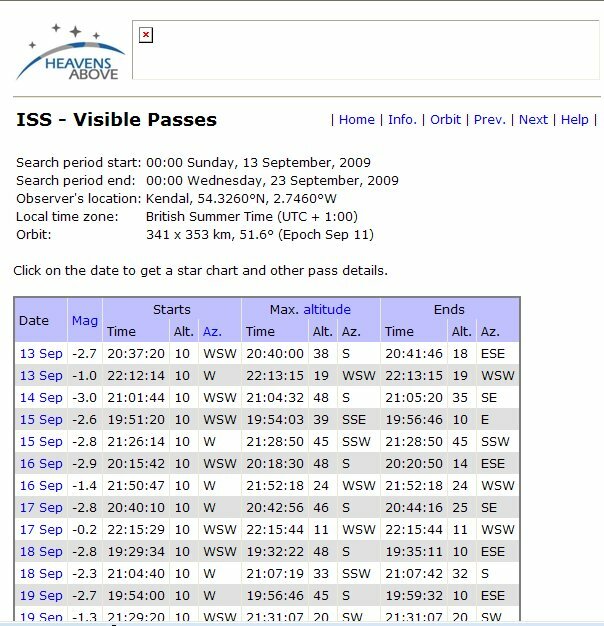 Some websites will give you the information about upcoming ISS passes in very easy to understand language. They tell you when to start looking, how bright it will get, and don’t decorate that basic info with any frills. Other sites will present you with a table of much more detailed information – rising time and direction, time when it’s at its highest, time and direction it will fade from view, maximum brightness, etc. Clicking on a blue-highlighted link will even bring up a simple chart of the sky, showing the ISS’s track across the sky. This is really helpful for people who have some knowledge of the sky and want to know in advance how close it will fly above or below a particular bright star, or planet, or even the Moon. 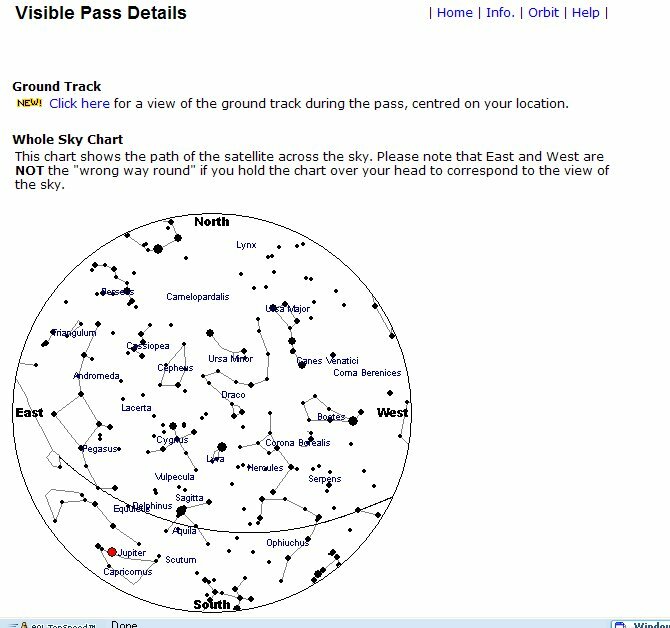 Here are the best websites I’ve found for predicting the times when the ISS will be visible from where you are. Simple! The page tells you the date and time when the ISS will be visible, when to start looking, how long the space station will be in the sky for, how high it will get in the sky, and when it will vanish from view again – all you need to see the space station! What it doesn’t tell you is how bright the ISS will appear, but you can figure that out for yourself by just looking at the figures for “Maximum height”, etc. The longer the ISS is in the sky for, and the higher it is in the sky, the brighter it will appear. Simple! Using that NASA website you will be guaranteed never to miss a good “pass” of the space station again – well, when the sky’s clear enough to let you see it, that is! 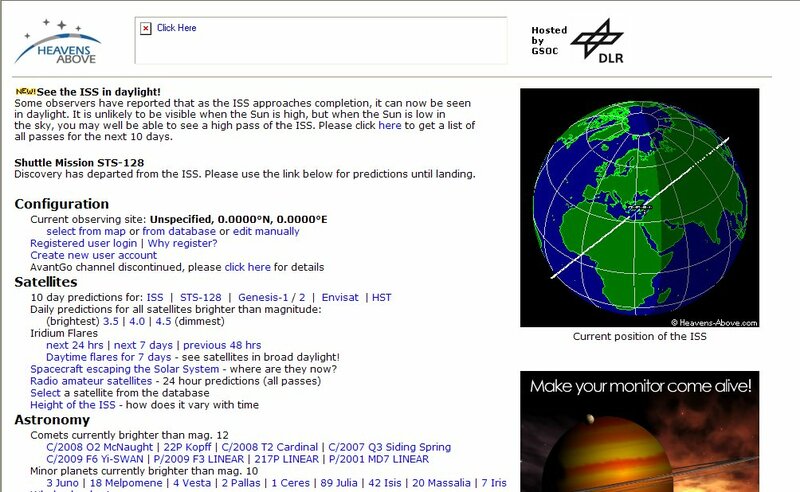 So, there you are, two easy to use websites that tell you where, and when, to look for the ISS! Right, enough blathering. When do you next start looking? The ISS is visible in the sky from Cumbria at the moment in the EVENING SKY. Please click on the following image to bring up a full size version. Then print it out. You’ll be able to use it to follow the ISS for the next week or so! So, that’s it, that’s all you need to get out there during the next month and see the International Space Station! * Although you can see the ISS easily from your garden, or front doorstep, if you possibly can, find somewhere dark to watch a pass from, especially one of the brightest passes, because seriously, at its best the ISS is shockingly bright, it looks like Venus skating across the sky, and if you’re out in the countryside somewhere, or even just in a local park, or in a road layby just out of town, it will look soooooo much better than it does from somewhere with houses and lights all around you. * If you have binoculars, take a look at the ISS through them. You won’t see its solar panels, or modules, but its brightness and colours will be greatly enhanced. It’s also great fun to watch it sailing “through” the stars! Eu gostária de saber o que posso fazer para fazer parte dos astrÔmos novos que estão chegando ? Former junior engineer of ITEK, ATD and LockHeed Missles and aircraft company of Sunnyvale,California. My wife and myself were just outside taking an after dark walk by the marina where we live North of Seattle, and got a perfect view of the station passing overhead from approx SW to NE. A minute or two later another passed, the shuttle following? Hello darling, sweet website! I really appreciate this post.. I was curious about this for a long time now. This cleared a lot up for me! Do you have a rss feed that I can add? I don’t want to sound like a dork, but eye adaptation to ‘darkness’ is > 20 minutes. Five minutes is not enough. Nice site! or another link shortening service. What Facebook visitors do is scroll through their newsfeed until an image gets their attention – it attracts their eyes towards the photo vs.
On Friday 8th August a dimmer light was about 10° behind the ISS same trajectory,any idea of what it was? ?